Three Reform missions from US called in to swell group numbers for organization's 25th anniversary; leader has called to scrap rabbinate. Women of the Wall marked its 25th anniversary with controversial prayers at the Kotel (Western Wall) Monday attended by 200 women, an unusually large turnout for the group, which rarely manages to muster more than a few dozen during its Kotel demonstrations calling for an end to traditional religious practices at the holy site. Numbers were swelled by three reform missions brought in from the US. The American reform missions, according to Women of the Wall's website, added 69 "lay leaders," 28 "clergy" and 5 "young people" to the turnout this morning. During their stay in Israel they are scheduled to meet Natan Sharansky, chairman of the Jewish Agency and the man who first proposed the notion of a compromise solution which resulted in a new prayer section designated for use by the organization. Rabbi Shmuel Rabinovitch, Rabbi of the Kotel denounced what he termed as Women of the Wall's "provocation", saying "now that a solution [alternate prayer space] has been found and they continue their struggle to sabotage it and cause more uproar, I don't know what expectations there can be for everyone's efforts." Despite ostensibly claiming to support "religious pluralism," Women of the Wall appears to have an agenda of destroying the structure of traditional Judaism, and in particular Israel's rabbinic institution. Back in July, Anat Hoffman, head of the group, wrote an article on the Religious Action Center for Reform Judaism website entitled "support our rally to end the chief rabbinate." After casting various accusations and slanderous statements, Hoffman concludes that "it is time to throw out the whole rabbinate." The sentiment has been repeated by different reform and conservative leaders. Just today (Monday), Conservative leader David Golinkin, president of the Schechter Institute of Jewish Studies in Jerusalem, said "the time has come to cancel the chief rabbinate." Hundreds of religious seminary girls and hareidi women also arrived this morning to protest the group's flouting of Jewish tradition, although they did not block the entrance to the women's section. Despite the request of Rabbi Benny Nachtweiler, CEO of the Bnei Akiva Yeshivas Center, for religious Zionist girls to attend, there was no organized turnout by them. Women of the Wall has agreed in principle to move to the "Ezrat Yisrael" space at Robinson's Arch constructed specifically for them, but only if a list of demands are met including the blocking of Orthodox Jews from the Western Wall who opposed them. 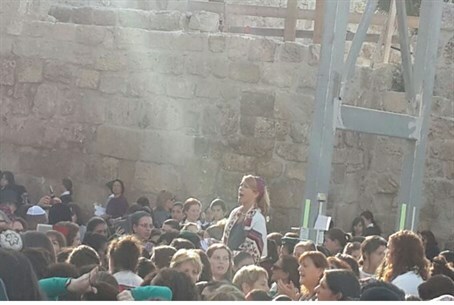 That demand specifically was meant to target Women for the Wall, a counter group formed earlier this year to preserve Jewish tradition at Judaism's holiest site. At the Jewish Federations of North America General Assembly in Jerusalem this month, Women of the Wall head Anat Hoffman and Women for the Wall head Ronit Peskin will hold their first public discussion on November 11, according to the event's website.